For reference, a 30 second earthquake has a magnitude of 7.4-7.6. A minute-long earthquake has a magnitude of 7.8-7.9. A two minute-long earthquake has a magnitude of 8.2-8.6; a four minute-long earthquake has a magnitude of ~8.8. The recent earthquake in Japan serves as a good reference to the Pacific northwest, demonstrating the moving continental plates and seismology levels in the Pacific Ocean. The Japanese earthquake was at a 9.0 magnitude, going longer than 4 minutes; this is expected to be the same for the Pacific Northwest. The Japanese earthquake killed more than 18,000 people, and cost an estimated $220 billion. The scariest aspect of an earthquake in the Northwest is not the shaking itself, but the tsunami that rolls in. The water is supposed to come crashing in from the Puget sound, flowing all the way east to I-5 approximately 15 minutes after the earthquake begins. 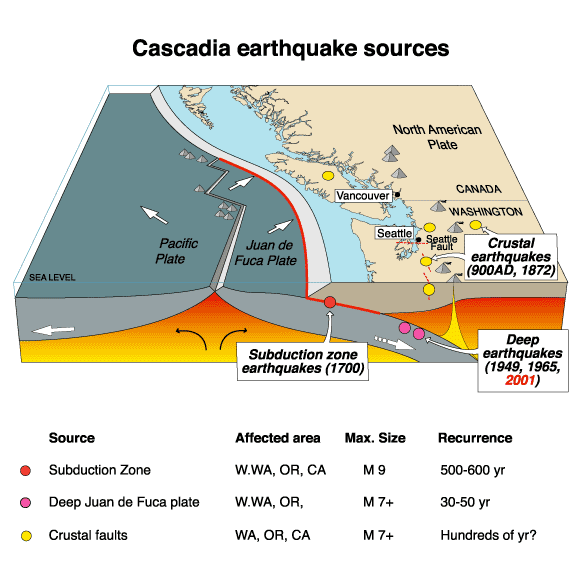 The boundary of this earthquake is not defined by the well-known San Andreas line, but instead by the Cascadia subduction zone, which runs for 700 miles off the coast of the Pacific NW, starting in Northern California and continuing through Vancouver, BC. The Cascadia Zone got its name from the Cascade Mountain range in the NW. 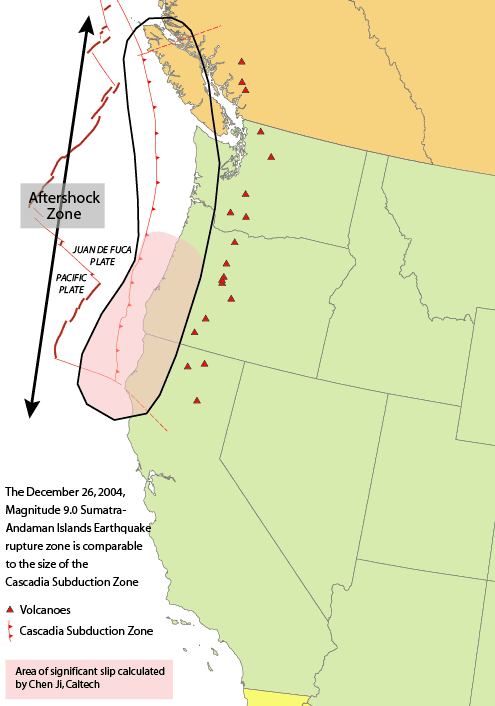 By seeing the closest picture above, we can see that the Cascadia Subduction Zone stretches from Northern California to Vancouver B.C. The worry is not necessarily the earthquake, but the tsunami that is supposed to follow 15 minutes after the earthquake strikes. This wave is supposed to be 700 miles long, and would easily take out coastal towns and cities that are west of I-5. The projected deaths of this earthquake is supposed to reach ~13,000, along with 27,000 people injured and 1 million displaced residents. 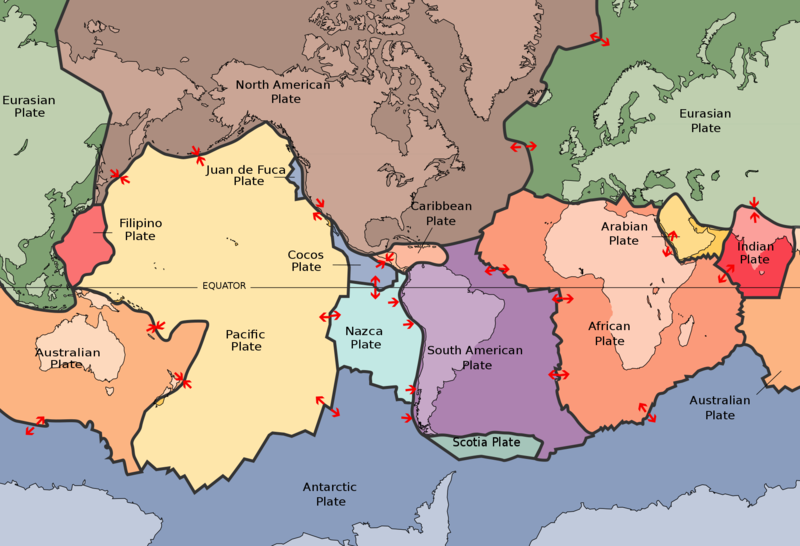 Supporting evidence for this impending earthquake comes from the ring of fire. With constant high magnitude earthquakes occurring in the ring (magnitudes usually of 9.0 and above), it serves as evidence for a high magnitude earthquake due near the Pacific NW. 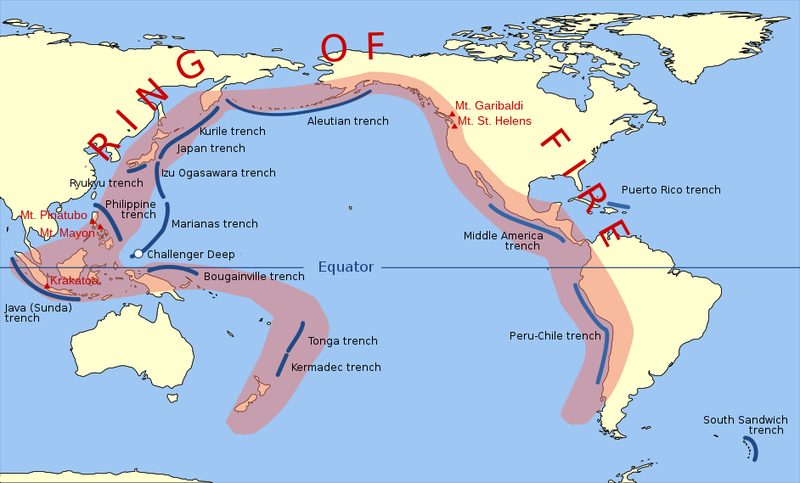 The ring of fire is truly a ring of subduction zones– with the colliding, sinking, slipping, compression, and tension of various oceanic plates going beneath continental plates, mountains form; this demonstrates and explains all the highly active volcanoes in this treacherous area. Surprisingly, seismologists today have gathered much of their research and evidence from ancient Japanese and Native American records of historical earthquakes. Using trees (western red cedars in the “ghost forest”) as reference marks, as well as Native stories of earthquakes, seismologists concluded that the Pacific NW has experienced 41 subduction-zone earthquakes in the past 10,000 years! From these numbers, the recurrence interval of Cascadia earthquakes is 243 years (see timeline above). This time period is not ideal because it allows mankind to build an entire civilization, which will soon turn into rubble and/or get drowned. Unless protected, anything glass will shatter. The electrical grid will fail. Bookshelves, lamps, computers, cannisters will fall down. 75% of all structures in WA state are not designed to withstand a major earthquake; the larger structures in particular will likely collapse. 1 million buildings are projected to collapse. 3,000 of them schools. Half of all highway bridges in the Cascadia region/subduction zone will collapse. 2/3 of Cascadia railways and airports will collapse. 1/3 of all fire stations will collapse (in Cascadia subduction zone). 2/3 of hospitals in Cascadia will collapse. 30,000 Seattle homes will experience land slide and/or liquefaction (where solid ground behaves like liquid). 15% of Seattle is built on liquefiable land. On this liquefiable land, there is 17 day-care centers, and 34,500 residential homes. Altogether, this shaking will trigger fires, flooding, pipe failures, dams, and hazardous-material spills. The average person is knocked over by ankle-deep water moving at 6.7 mi/hr. The tsunami will likely be moving at ~15 mi/hr when it hits. The tsunami height will vary depending on the coastal elevation. The wave height could max out at 100 ft.; if you live in an elevated area, the wave could still pass through at 20 ft. high. The tsunami wave will look like the whole ocean elevated, overtaking land. The tsunami will not be soft– it will be a 5-story deluge of waste, trucks, doorframes, concrete blocks, boats, utility poles, and other fatal material. The entire tsunami devastation will be so vast, that one must be in the international space station to see the disaster in its entirety. Just east of I-5 and in its corridor, it will take 1-3 months to restore electricity. It will take 1 month – 1 year to restore drinking water and sewer service. It will take 6 mo. – 1 yr. to restore major highways. It will take 18 months to restore health-care facilities. The economy in the Pacific NW will collapse– much of the government owned infrastructure and systems will go to waste (all those tax dollars would go to waste!). Private and public businesses in their previous inundated location could not operate any longer. This results in an economic shutdown; many essential businesses that are crucial to the functioning, transportation, and defense of this country, will falter (e.g. Boeing, Starbucks, Amazon). Same numbers as earthquake (which included tsunami) — 27,000 injured, 13,000 dead. ^^ These stats are based on a winter Seattle day. If the earthquake struck in the summer, where residents flock to coastal beaches, the numbers would be much higher. A large theme that comes to focus is the issue of health and safety. While current society is wrapped up in the latest technological innovation or current fad, we are not thinking ahead about the long-term defense, stabilization, and protection of our country for the future. Yes, we have a strong military. Yes, we have a prosperous and growing economy. But when a region is at risk for a natural disaster, shouldn’t we build from the inside-out? By having earthquake-resistant and stable infrastructure, as well as a carefully crafted water/sewage/industrial engineering system, the potential devastation could be significantly reduced. Our country must think deeply about the future and its natural threats. If you have any questions or comments, please contact us at Magnolia Insurance Agency. Remember your 2015 New Year’s Resolutions? Stick to ’em! It’s July 21st, and we’re already more than halfway through 2015. It is summer in Seattle, providing beautiful sunny weather to have fun, play along the water, go to social gatherings and get-togethers, go on vacation, spend time with family, and much more. However, we must not forget the long-term goals each of us established for this year. Usually, most people forget, or drop out of their New Year resolution ~2 months into the New Year. Not many are able to sustain their long-term goals; however, achieving these goals result in greater fulfillment, happiness, and satisfaction. Whether your goal is physical and/or mental, you will achieve the mission if you set your mind to it. Let your friends and family know how important this goal is to you. In current society today, most people are looking for the easy, short way out of difficult things. The truth is, to accomplish any challenging task, time, commitment, and effort is required. To stick to your New Year’s Resolution, you must commit to it every day. We also must keep in mind the importance of patience when embarking on such tasks. Sometimes, success takes time. Perform everything in moderation, but be sure to leave open suitable time every day to work on your specific 2015 Resolution. A common practice to help achieve goals is to be organized, both in your time and appearance. Keeping your room or office space tidy helps put you in a simpler, cleaner mindset to get things done. Sticking to a daily routine helps enforce timely organization. It is also important to consider the amount of time you spend on different tasks. Keeping a time log of your daily schedule helps you target areas that could use more/less time; it particularly helps you find times when you can work on your New Year’s Resolution. In the end, accomplishing any goal or resolution must come from within. Doctors, nutritionists, advisors, mentors, and trainers can only offer advice (and short-term help); they cannot micro-manage your daily life. Resuming or starting a resolution is never too late! Don’t wait until next week; start it today. You can do it. If you have any questions or simply need more motivation, don’t hesitate to call us at Magnolia Insurance Agency.